WE'RE GOING to play word association. I'll say a word and you say what first comes to mind. OK, a few of you said "bear," but I'd venture that a majority of the rest said "Orange Chicken," especially given the visual clues on this page. Truth is, Panda Express Orange Chicken is something of a pop-culture phenom. At 900 Panda restaurants in 36 states, those little glazed nuggets are the No. 1 seller, accounting for 38 percent of sales, even though diners typically have 19 other menu choices. "We have people banging on the door after we're closed, saying, 'Can we just have some Orange Chicken?' " says Randal Abrams, training leader for Panda in Hawaii. "Even during a power outage, we have people saying, 'Do you just have Orange Chicken?' "
Last year, Abrams says, the chain sold 39 million pounds of that chicken. The Panda chicken recipe is among top requests from readers of this column. Don't get your hopes up, though, I don't have it. Panda won't release it, nor will it give up its No. 2 seller, Beef Broccoli, and no one says they have to, so you can all stop asking. So, why bring this up? Well, I do have some clues to offer (keep reading). Plus, Panda is celebrating 20 years in Hawaii next week with a party at its newest location, in the Moanalua Shopping Center. The governor's expected, along with company founder Andrew Cherng and other Panda bigwigs. "This is a big deal for us," says Bob Lustig, vice president of operations for the Panda zone that includes Hawaii. Hawaii's first Panda, after all, rakes in the highest revenue of any Panda anywhere -- that's $4 million annually at the Ala Moana Center food court, Abrams says. Moanalua is on its way to the No. 2 position nationally, he adds, and represents Panda's vision for the future. It's free-standing, rather than tucked away in a food court or strip mall, located in that major commercial land mass around the Pearl Harbor Navy Exchange. Also, it has an open "show kitchen," a la Roy Yamaguchi, and a drive-though, a la McDonald's. "It's the first drive-through Chinese restaurant in the country," Abrams says. 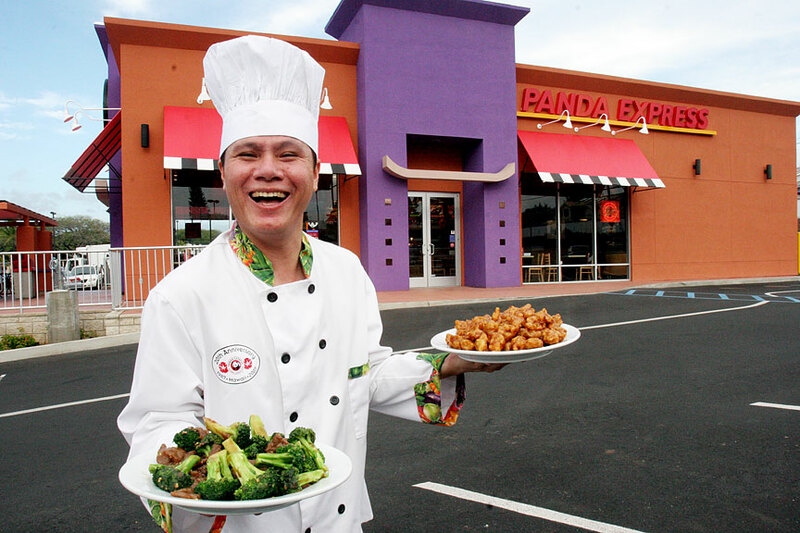 The Panda empire began more than 30 years ago as a full service restaurant, the Panda Inn in Pasadena, Calif. The first Panda Express opened in nearby Glendale in 1983. Panda's Hawaii restaurants now number 12, but plans are to open five more this year and to eventually expand to 40, Lustig says. Nationally, the plan is to add 150 restaurants per year, with a vision of 10,000 -- "over however long it takes." Darren Tristano, executive vice president at Technomic, says the newer Panda stores reflect customer interest in a dining experience that's a cut above fast food, with nicer dining rooms and more variety, but still quick and convenient. Chuck Gee, dean emeritus at the University of Hawaii's Travel Industry Management school, helped recruit cooks for Panda and knows the local operation well. "People like things popularly priced -- 'popular' is a euphemism for 'cheap' -- and they like it fast and not complicated. Panda satisfies all three." 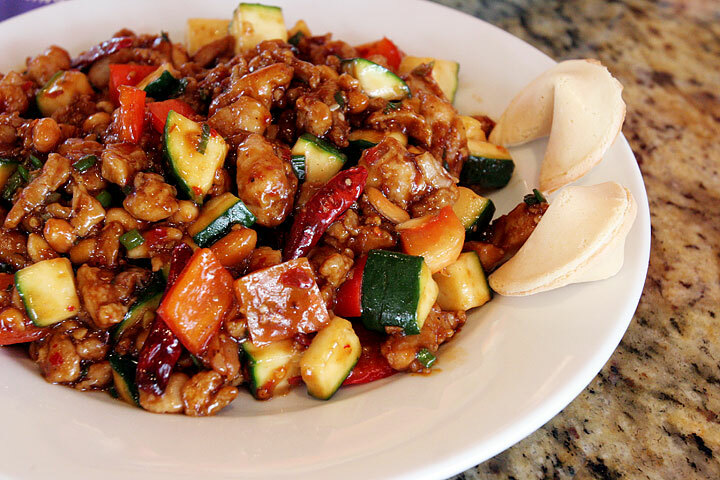 Gee says Panda also has been successful in developing recipes that can be produced quickly by cooks with no training in classical Chinese, with flavors that appeal both to customers who understand Chinese food and those who need a more Westernized approach. WHICH BRINGS the discussion back around to Orange Chicken. 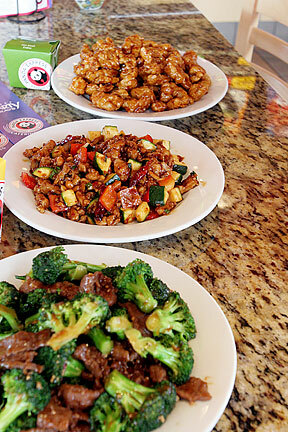 Panda's version was inspired in Hawaii, around the time the Ala Moana store was opening. It was based on local-style fried-chicken dishes (think mochiko or garlic chicken), as much as on the traditional Chinese dish. The idea was taken to the chain's chefs in California for development. At first, Lustig says, it was a "chicken-wingy kind of thing, but they realized it was a little difficult for customers to eat." The dish has roots in a traditional Chinese dish, Chen Pi Gi, that shows up in Hunan, Szechuan and Cantonese cooking. Gee says the traditional version is made with dried orange rind, giving it a much more assertive, fresher taste. The chicken is normally chopped with the bones left in. The Taiwanese equivalent would be General Tso's Chicken, made with fried boneless nuggets and a sauce that often contains tomato sauce or ketchup. Panda's version is typical of how the dish has been Americanized -- still tangy, but sweeter. HERE'S WHAT I can tell you about Panda's formula: The boneless chicken pieces are breaded, fried, frozen and sent here from corporate kitchens in California. The nuggets are re-fried in local restaurants, and the sauce is made fresh from a base mix of sugar, vinegar, soy sauce and orange extract. Cooking wine, sesame oil, chili peppers and minced garlic and ginger are stir-fired in a hot wok, then the soy mixture goes in, then the fried chicken pieces. All you kitchen chemists can have at it -- let me know if you get close. Orange Chicken came to be the chain's top menu item without benefit of any national campaign, but Gee has his theory. He visited a lot of Pandas while helping the chain recruit, and noticed that employees were quick to offer free samples of Orange Chicken. "If there was a slack moment, there'd be a girl handing you a toothpick with a piece of chicken. I figured if I stood in line long enough I'd have enough chicken that I wouldn't have to buy anything." No luck getting that Orange Chicken recipe, but Panda was willing to part with another of its top dishes. Combine marinade ingredients. Add chicken; refrigerate at least 1 hour. Heat wok on high heat 10 seconds. Add 2 tablespoons oil and heat well. Remove chicken from marinade and add to wok. Stir-fry quickly, 60 seconds. Remove chicken; drain well. Add chili peppers. Stir-fry until they darken. 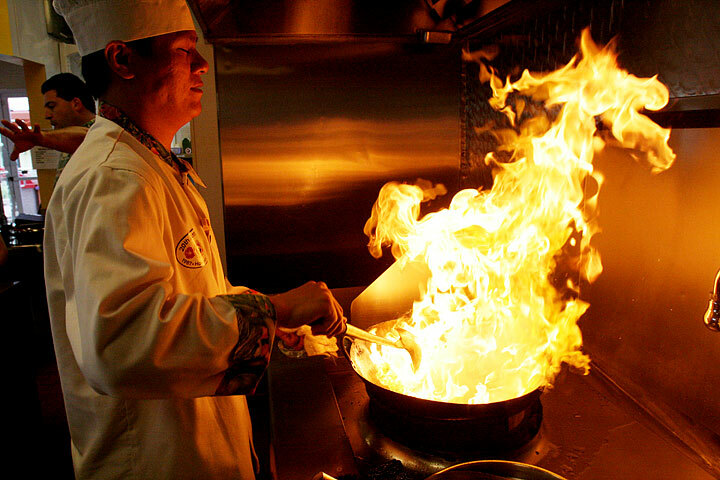 If wok becomes too dry, add 1/2 tablespoon vegetable oil. Add green onions, ginger, garlic and crushed red chili pepper. Stir-fry 5 seconds. Return chicken to wok; stir soy sauce/wine mixture and add; stir until sauce boils, then add cornstarch mix to thicken. Add sesame oil and peanuts. Stir and fold until ingredients are thoroughly mixed. Serves 3. Approximate nutritional analysis, per serving: 750 calories, 40 g total fat, 4.5 g saturated fat, 125 mg cholesterol, greater than 1,250 mg sodium, 53 g carbohydrate, 17 g fiber, 2 g sugar, 50 g protein.